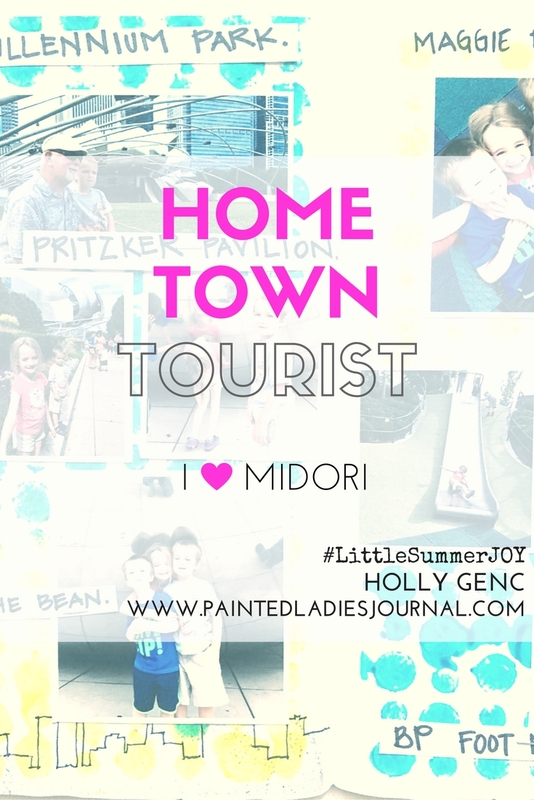 I'm working on my #LittleSummerJOY midori project again! I've been busy the last two weeks making lots of family memories and now it's time to get documenting. 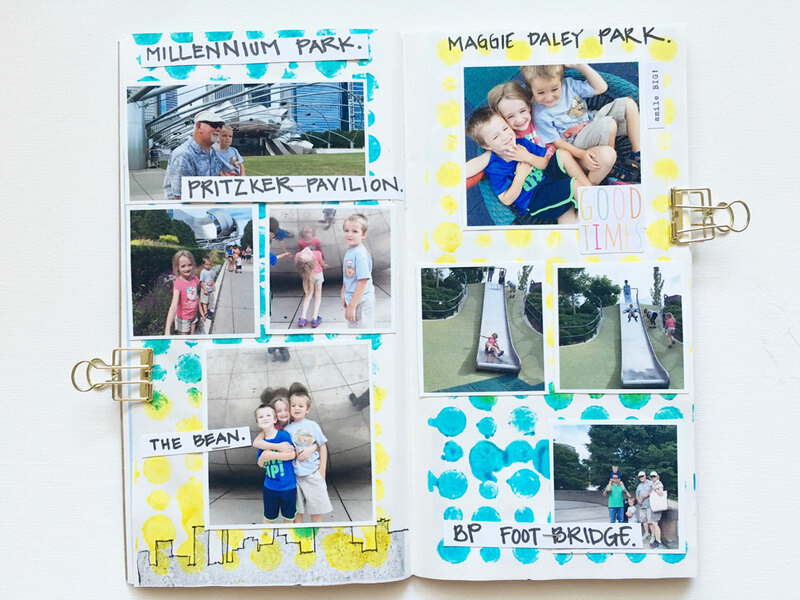 This project has been a fun new way to document our memories and still use my scrapbook supplies. 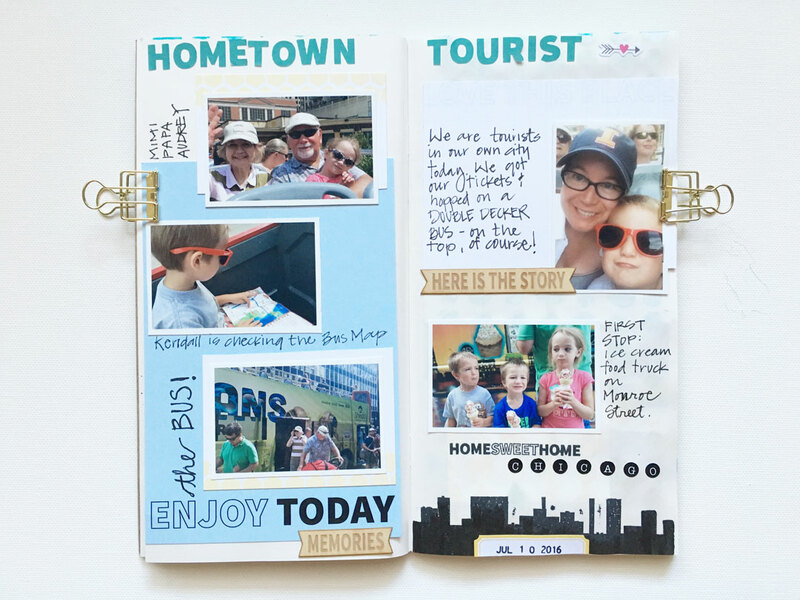 I got out my shiny new July Take 10 Kits (the pocket kit is sold out but there are some reduced sets that don't include the stamp here and got to work making 3 spreads of our day playing the role of "hometown tourist." I actually squealed when I read this prompt on www.littlepaperprojects.com (It was Lesson 2: Hometown Tourist) because we had just done this. Riding the Chicago Double Decker Bus was on our Summer Bucket List. 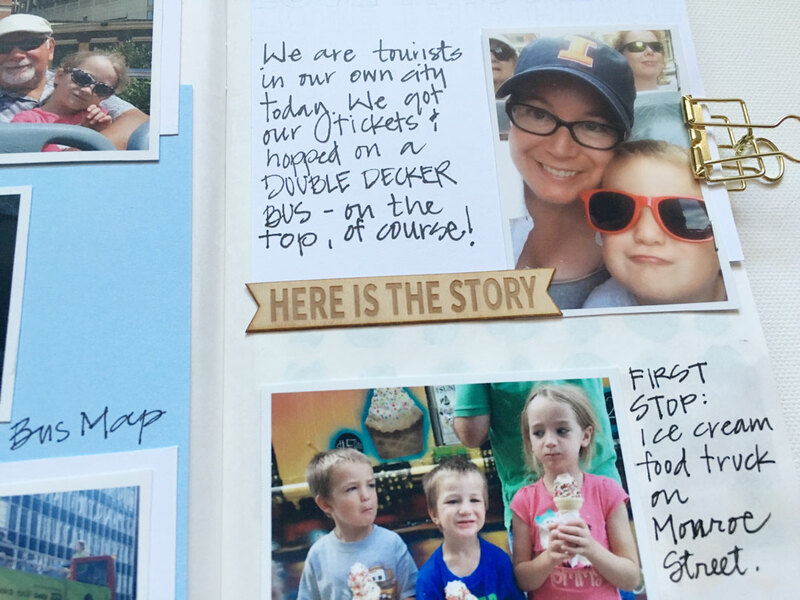 And really, how perfect is the July Take 10 Kit for this prompt about being a tourist in your own city?? That skyline stamp! Yes! There were so many fun photos from this adventure, so per typical for my midori books, I chose to make a bunch of collages with the PicStitch App and then cut them all apart to create mini layouts. This page was a lot of fun to create. My mother and son were sitting across from me doing some dot art while I was working on this. I picked up the stencil from the July Take 10 Glam Bag and ask for that blue and yellow paint when they were done. (yeah, probably not archival, but I was in the moment) I made opposing patterns on each page to create a fun background. I outlined the skyline stamp that was showing through from the backside. If you can't cover it, go with it. I cut out simple strips of cardstock to create titles that would pop on this background. I think it's my fave. Page 3 of this prompt! 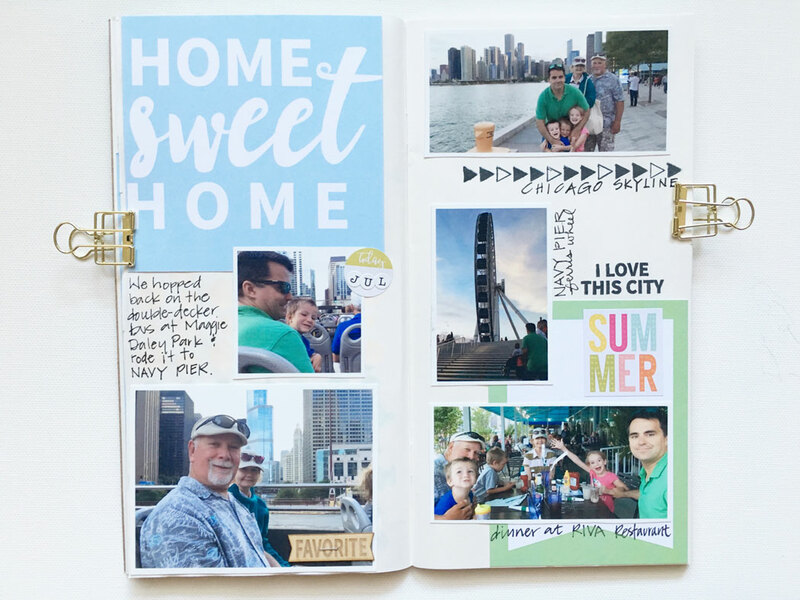 I cut up that "Home Sweet Home" Card and used more of the stamp set from the July Pocket Kit. I also had some stickers left from the June Take 10 Glam Bag that are on each of these spreads. I imagine I will end up using that whole set in this book.